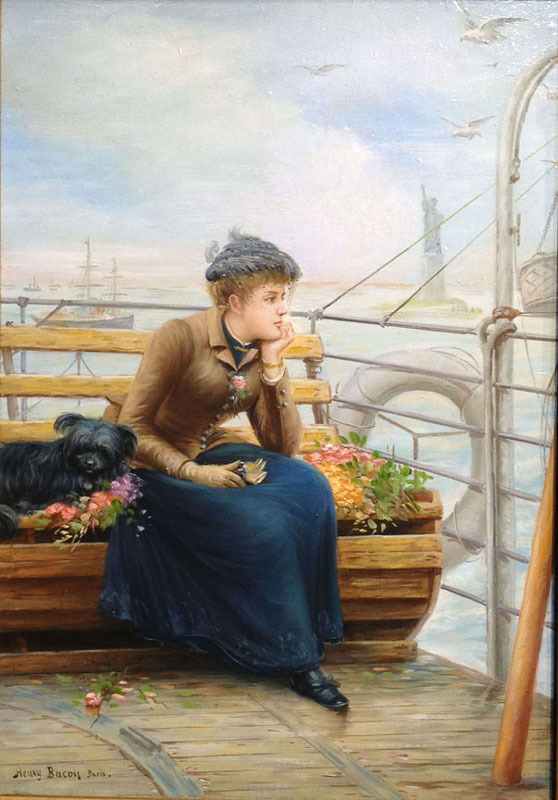 Henry Bacon, born in 1839, was a figure painter of the expatriate genre. He was one of the first Americans to be admitted to a Paris school, Ecole des Beaux-Arts. There he was schooled in the conservative French tradition of the late 19th century. Bacon enlisted in the Civil War and served as a field artist for "Leslie's Weekly". After the war, he perfected his techniques in watercolor using oblique angles and cropping effects. He popularized the perspective scenes on decks of passenger ships, which he observed during his frequent travels. Bacon was highly acclaimed for his watercolors. By 1895 he began to experiment with pure washes without opaque body color in figures. Henry Bacon died in 1912 in Cairo, Egypt.